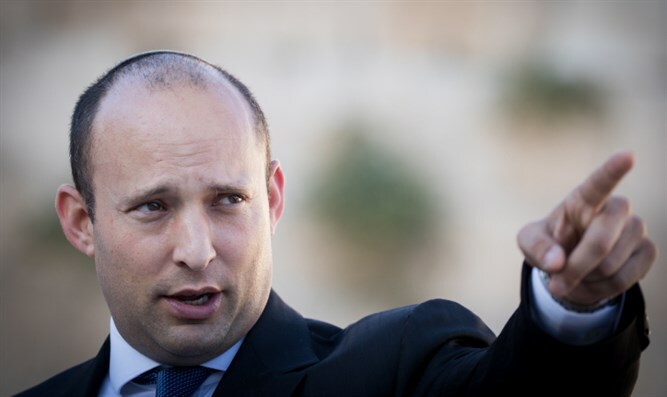 Israeli Education Minister Naftali Bennett (Jewish Home) spoke to Israel Radio on Monday morning about the internal conflicts between his party's National Union-Tekuma and Jewish Home factions. The National Union recently sent a letter the the Jewish Home asking for clarification about their running together as they did in the last elections. "I definitely want to open our party to many sectors of Israeli society," Bennett said. "Traditional-religious, secular, Druze Arabs who are Zionist - they aren't many, but they aren't few, either." "Justice Minister Ayelet Shaked (Jewish Home) is an example of a secular Israeli whom I would want three or four more of." In a letter to the National Union faction head, Bennett wrote, "They should run in the primaries. Welcome. There's nothing ideological here. I appreciate our MKs Bezalel Smotrich and Uri Ariel, I think they are great people, and I think they'll succeed in the primaries. They should run." When asked why his party and the National Union-Tekuma faction had held separate primaries in the previous two elections, Bennett said, "There's a big difference between 2013, when we were just getting into politics and unifying what had been until now two separate parties was a complex process. Then, it was logical. Now, we're four years later. We get along terrifically. I don't differentiate between Tekuma and the Jewish Home. Why should Deputy Defense Minister Eli Ben-Dahan and Ayelet Shaked run in the primaries, but Bezalel and Uri shouldn't?" "If someone wants to explain the logic to me, I'm open to changes." The National Union party is opposed to primaries, considering them prone to corruption and a waste of money.